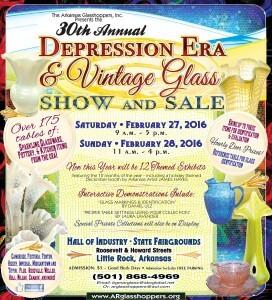 Arkansas Glasshoppers, Inc., Welcomes You! – Welcome glass enthusiasts! With heavy hearts, we regret to inform you that our annual Glass Show is cancelled for this year. We do not anticipate having one again in the future. As to the “why’s,” there are several: (1) Our members are not getting any younger, and this show is a lot of work provided by 100% volunteer efforts; (2) Our dealers are not getting any younger, and some have retired from the business; (3) Our efforts at recruiting younger members have not been very successful. 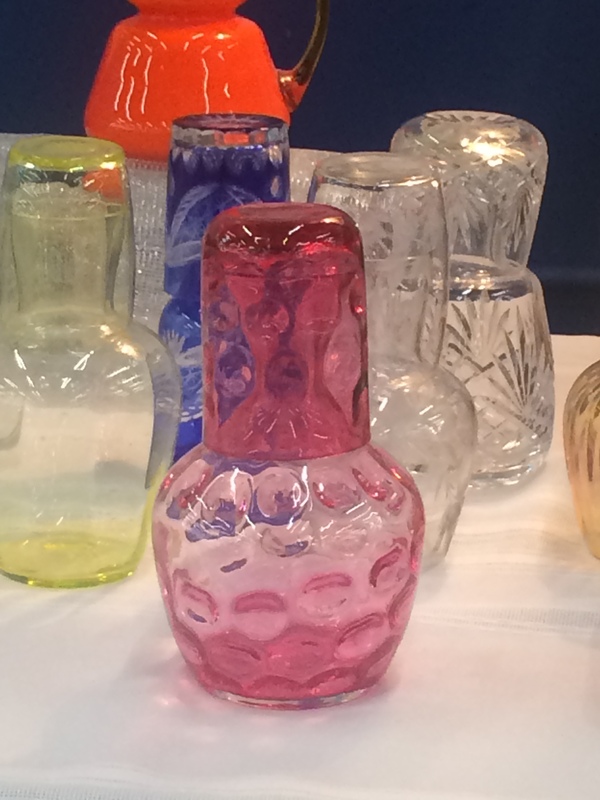 The glass we love is a beautiful and important part of the history of the United States. Sadly, lack of demand can devalue even the most valuable items from the past. On that note, we would like to ask a favor: If anyone reading this has any “in” with any millennial or Gen X influencer or bona fide celebrity, now would be the time to try to cultivate their interests in the true American craftsmanship of Depression-era glass. Or maybe post beautiful pictures of your glass (or anyone’s glass) on Instagram, Pinterest, or FaceBook. You are also invited to enjoy food and beautiful glass with us one evening a month at our “Third Tuesday” meetings usually at the Fletcher Library. Just contact us on FaceBook or at arglasshoppers@gmail.com. As for us, no matter how old we get, we are going to keep celebrating our glass enthusiasm until our last breath! We are discussing possible road trips to shows in other states or glass museums? Or developing more content for our YouTube channel? If that interests you, or if you have other ideas, contact us to share. Love American Glass. Save American Glass. It is a sad day for all of our club members and all family and friends of Joy L., our beloved glass enthusiast! Joy was a beautiful person with extraordinary passion for fine things, especially glass. Joy had a keen eye for finding the diamond in the rough and enjoyed the hunt as much as the treasure. She will be missed. Her family and friends are in our thoughts and prayers. Saturday, February 24, 2018 from 9 a.m. to 5 p.m.
Sunday, February 25, 2018, from 11 a.m. to 4 p.m.
Due to the remodeling of the Fletcher Library, the meetings will be moving around for the next few months. We anticipate the library will be available in August. You are invited to attend our next monthly meeting. Please join us on Tuesday, April 18th at 7:00 pm at the US Pizza. The food and program will be provided by Jo Ann and Brian. Please bring pieces for show and tell and/or to identify. Our website gives us the ability to connect with glass collectors, glass enthusiasts, designers, decorators, dealers, and anyone else who loves Depression-Era and other glass all over the world. We would also like to connect with all of you in the Central Arkansas area and invite you to attend one of our monthly meetings in Little Rock. For more information, email us at arglasshoppers@aol.com, arglasshoppers@gmail.com, or on our Facebook page.